Civilian staff are to take part in a series of strikes at the Faslane and Coulport naval bases in a dispute over workers' rights with Babcock Marine. The move comes after Unite union members backed industrial action. A continuous overtime and on-call ban is due to start on 24 March. It will coincide with "a series of staggered periods of strike action", which the union said would have an impact on naval operations until 15 June. Babcock said it had "positive relations" with Unite across its sites and was disappointed with the announcement. Unite said the action would affect all areas at the bases, including the nuclear operations department. 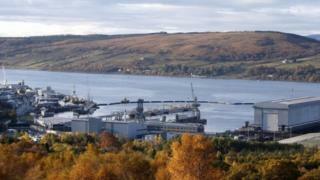 The Faslane base on the Clyde is home to the UK's fleet of Trident nuclear submarines. Unite has accused Babcock of a "systematic campaign to undermine workers", claiming it had withdrawn facilities for shop steward meetings and was "failing to meaningfully consult and negotiate with the trade union". The union represents a range of workers at the two bases, including cleaners, housekeepers, logistics operatives, drivers and mail staff. It also has members in radiation monitoring and strategic weapons support roles. Unite regional officer Stephen Deans said: "This action will coincide with a particularly busy period at both Coulport and Faslane and will cause major disruption to the day-to-day services that Babcock Marine provides. "This includes land-based repairs, mail delivery, feeding the Navy sailors at their normal mealtimes, and nuclear operational and waterfront services. There will be a severe impact. "Our members work hard supporting the Royal Navy's operations. "They refuse to be intimidated by a private company whose biggest interest at the moment seems to be weakening workers' rights so that it can squeeze all the cash it can from the nation's defence." In a statement, Babcock said: "Babcock has positive relations with the Unite trade union across our sites and we are disappointed with this statement. "We are already actively engaged in discussions with Acas and Unite on the issues that have been raised with us and made good progress at our meeting on 7 March. "We fully expect these issues to be successfully resolved when we meet again with Acas next week".